Greeting from fresh but sunny Munich. It is day two at Intersolar. There is so much happening here that it is easy to get sidetracked and distracted. This morning I had to refocus with a pretzel and coffee to remind me that I am here to learn more about development in microgrids. We are looking forward to meeting Siemens head of energy management and power quality in Australia in the coming days. 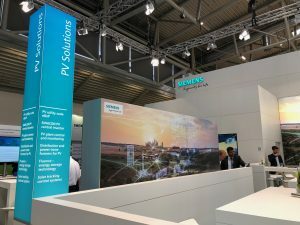 I decided to start with Siemens. They really seem to have a market on its own as their diverse product range allows them to do. They target renewable generation project in the mega-watts range, which in this stage isn’t something we have explored in our business plan. However, their energy management and power quality product range is definitely in our area of interest. Tandem Energy will be introduced to the head of this Department in Australia in the coming days. This new contact will assist us in providing solutions to our potential customers in the low voltage market. ABB operates in a similar sector to Siemens, however they offer now products for residential customers as well, therefore providing a full spectrum of energy efficiency and generation related products in our current market space. 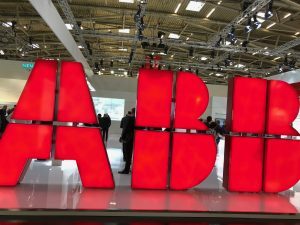 At this event, ABB introduced their new home energy storage system. It consists of scalable 4kWh storage units which can be AC or DC coupled which makes this unit suitable for retrofitting as well. There is no data sheet for this unit as yet, but we will have some info soon. ABB now offer products for residential customers, therefore providing a full spectrum of energy efficiency and generation related products in our current market space. 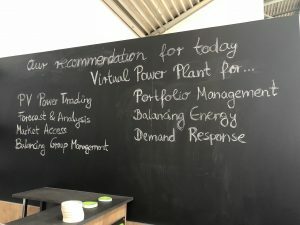 I have realised during my time here at Intersolar that there have not been a great deal of projects developed around the microgrid concept as regulatory challenges together with high upfront investment cost meant this isn’t the most attractive proposition for operations running on a stable grid. This realisation has reinforced my thinking around optimization and timing of energy consumption being the main ways to drive cost down in the Australian market. Having said that, I have to mention the good work Socomec is doing in this space for which they received an Intersolar award. They offer an energy interface at a relatively low price which can be integrated to a BMS or Scada system at a later stage. It is becoming clear that for most of our customer base monitoring and control is generally out of their budget. SMA have also realised that. 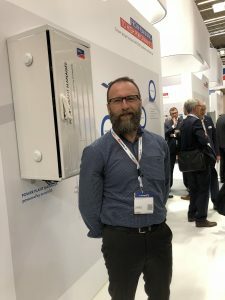 Their new energy management platform is structured around business partnerships where equipment control is delivered at the time of product development or assembly, making communication between loads and intermittent renewable sources/system easy to integrate. This is also evident in their all-in-one battery storage products where all of the controllable devices such as water heater, car battery charger etc form part of the package. 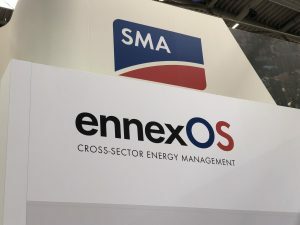 SMA’s new energy management platform works directly with equipment manufacturers for ease of integration. Tandem Energy’s focus is always on energy efficiency and integration of technology to support our mission. The HeatStixx by Axiotherm product range could be something we will evaluate and consider adding to our portfolio. This package phase change material is a building block for cooling and heating. The flexibility of this product opens up opportunities to develop products for passive and active space conditioning. I could not resist but go back to Power2Drive section of the Expo. Greenpack is definitely a game changing approach to battery driven mobility, with battery packs that can easily be swapped in and out as needed. The product is still in development as they look for manufacturers of bikes, motorbikes and light vehicles to adopt and integrate their system to make it as standard as AA or AAA battery for powering electronics. This could be an ideal transport option for inner city or cities that look to reduce their carbon contribution. It looks like it will take some time till this product becomes commercially available but we live in a fast world and this also might come earlier that predicted. After another busy day, I plan to spend my Day 3 finding out more about the winners of Intersolar awards in 2018.